Cartridge Life 100,000 gallons At just 5.5 ounces in weight, this durable BPA FREE water bottle can deliver clean water as fast as you can drink it. 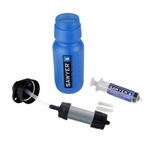 Use the included filter with the bottle, on a hydration pack, or as an ultra light filter option. 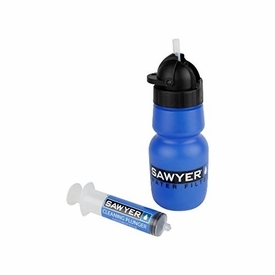 We think the bottle we�ve included is pretty sweet, but just in case you don�t we�ve design the cap in standard 63mm, to fit on most other wide-mouth water bottles.